Express your love for breakfast this Halloween. 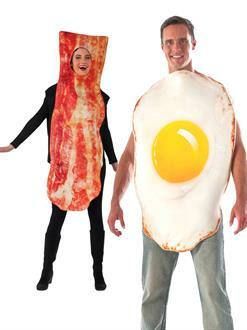 Purchase the Bacon and Eggs KIT as a couple’s costume. The two-part ensemble features an egg tunic and a bacon tunic. Finish this great ensemble with a matching pants and shirt combination. For fun accessorize with breakfast themed jewelry.